Muay Thai legend Saenchai sor Kingstar has left Bangkok city life behind to join the hugely successful Sinbi Muay Thai in Phuket. Widely recognized as the best pound for pound fighter in the world, Saenchai feels it is time to raise his International profile and give his family a better quality of life on Phuket. Sinbi Muay Thai is delighted to add Saenchai to their stable of Thai fighters and have the opportunity to offer his years of experience to Sinbi students who can receive private lessons from the superstar as he builds up to his debut fight for the gym on the 7th December. The fight will take place at Lumpinee where he defends his WMC title at 133lbs, against Nongo from Sitor Gym (133 lbs). Saenchai also has a number of international fights in the pipeline. Saenchai comes with his 10 year old son, Deow, as well as two fighters from Bangkok – PaePae (15 years old) and Samurai (10 years old). All three will be fighting out of Sinbi Muay Thai and it will be a great privilege to watch them grow as fighters under the tutelage of Saenchai. Saenchai’s son loves hip-hop and dancing and from what has seen so far, it is equally likely that he will become a world famous dancer! Like his father, he clearly has many talents and is an all round exceptional athelete. Saenchai is from Isaan in the north east of Thailand. He started practicing Muay Thai at the age of 8 and has at least ten major championship belts to his credit. He has been Lumpinee Champion three times (in different weight categories). He was World Champion at 130 lbs. He has been named Fighter of the Year on two occasions, in 1998 and 2009. 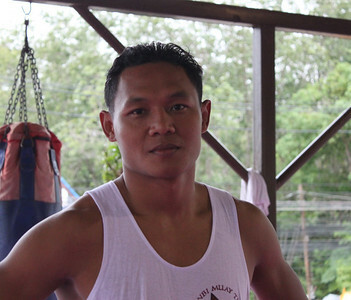 It is a testament to his unique ability that he received the second award when he was only 30, as most Muay Thai fighters retire in their mid twenties. Saenchai is also a very talented footballer and last year he visited Phuket for the Kata Cup as part of the Muang Thong squad. Sinbi Muay Thai in Phuket was established approximately four years ago by the internationally renowned Muay Thai (Thopadake) and K1 fighter – Sinbi Taewoong. Sinbi Muay Thai is now under co-ownwership with British business woman Dr Lynne Miller. Sinbi Muay Thai has built a strong reputation as a traditional Muay Thai gym which has successfully managed to retain high quality fighters, whilst also providing training for students who come from all over the world. These students benefit from the opportunity to train with the greatest selection of ex-champions anywhere in Phuket. Saenchai’s new fighting name is Saenchai SinbiMuayThai and Sing and Lynne and everyone at Sinbi welcomes him to the gym and looks forward to a long and fruitful partnership. I cannot wait to see what lies in wait for Saenchai. One thing’s for sure Nong-o is no easy fight but almost anything seems possible for Saenchai as I’ve seen him overcome many larger opponents with his high level of skill and precision timing. *Much thanks to Dr.Lynne for the photos! ~ by fatsoking on November 30, 2010.
awesome for saenchai. how many times has he fought nong-o before?